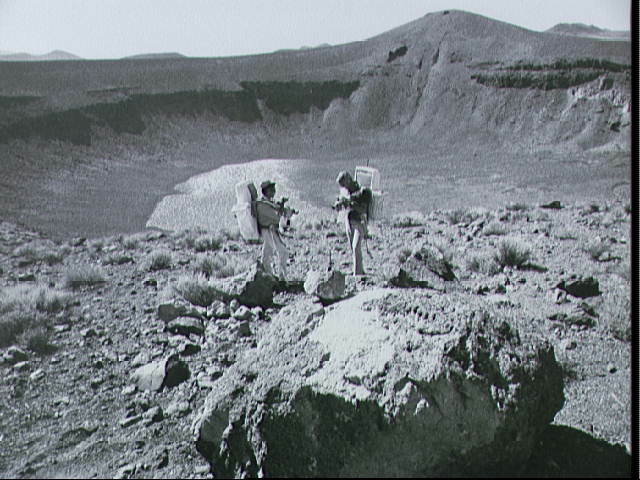 Two members of the prime crew of the Apollo 17 lunar landing mission examine rock specimens during lunar surface extravehicular activity simulation training on a geological field trip to the Pancake Range area of south-central Nevada. They are Astronaut Eugene A. Cernan (right), commander; and Scientist-Astronaut Harrison H. Schmitt, lunar module pilot. They are standing on the rim of Lunar Crater, which is about 600 ft. deep and five-eighths of a mile in diameter. It is a volcanic crater.